I feel nervous about writing this review because with every sentence that I write, I am aware that I am only scratching the surface of a complex and undeniable masterpiece: James Baldwin's Go Tell it on the Mountain. The heavily autobiographical novel traces the lives and histories of various characters; primarily our protagonist, John Grimes, but also his father, Gabriel, his mother, Elizabeth, and his aunt, Florence. 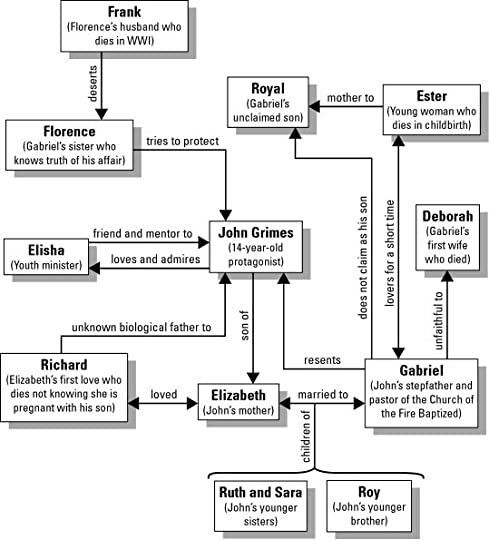 Between them are conflicts, and - as evidenced by the family tree below - secrets. In the characters' world (the story is set in Harlem, NYC, 1935), religion is the highest absolute; however, an indelible element of danger, wrath and fear lies in the holiness of their faith. Neither love nor humility had led her to the altar, but only fear. And God did not hear the prayers of the fearful, for the hearts of the fearful held no belief. Such prayers could rise no higher that the lips that uttered them. God was just, and He struck no people without first giving many warnings. God gave men time, but all the times were in His hand, and one day the time to forsake evil and do good would all be finished: then only the whirlwind, death riding on the whirlwind, awaited those people who had forgotten God. This kind of paradox is also captured by a simple sentence in the novel when Baldwin writes about "the ambulance that raced to carry someone to healing, or to death." It is almost inevitable, then, that John - who cannot separate his devotion to God with his submission to his fearsome father - begins to wonder, "and why did they come here, night after night, calling out to a God who cared nothing for them—if, above this flaking ceiling, there was any God at all?" What he, and some other characters in the novel suffer, is essentially this: a crisis of faith. The novel thus captures the hypocrisy of the church through the double standards of its upholders; Gabriel, although a holy man, is haunted by the "lions of lust and longing that prowled the defenseless city of his mind"and still beats his son, using religion as his reason. Elisha, although committed to the church, is berated for spending time with Ella Mae. It is not only duplicity that is associated with the church, but also repression. And it is from this portrayal of the house of God that Baldwin's criticism stems most strongly. At the same time, the novel also tackles social issues that are still inherent in today's society. The first is repressed homosexuality, evident from the start through young John's intense fascination with Elisha (their wrestling scene is so tense and powerful for this reason). At the same time, we are also briefly exposed to the matter of gender inequality, seeing how the young and reckless Gabriel received "the education that Florence desired far more than he" just because he was the "man" of the family. And in a brief moment from Elizabeth's past, we learn about how John's biological father - Richard - was wrongly accused of a crime he did not commit just because "all black men looked the same" to the police officer in question. Go Tell it on the Mountain is a novel I'd love to study in an academic setting, so that I could better grasp its biblical references and historical context. Written with an unceasing intensity, magnetic rhythm and focus, it is a book that deserves to be reread and preserved.